From the day-salt Momiji Line direction, do not enter Shiohara Hot Spring town, the road highway on the right side of the road straight. I installed an EV (electric car) charging station.It is safe for business trips and traveling by electric car! 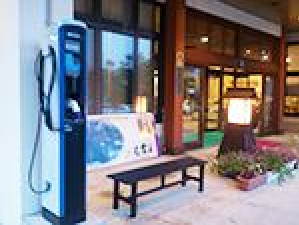 You can charge firmly during your stay.Please use plug-in hybrid car, charger for electric car. ★NRX has adult holiday club discount (10% discount).Direct drive from Shinjuku and Oji one flight a day.Sit back leisurely and do not change! Agripal Shiobara you change Agripal Shiobara, four flights weekdays.On Saturdays and Sundays, 6 flights in operation! On the way back, I stopped at Oji / Ikebukuro station east exit (getting off the station).The journey to Shiohara Hot Spring has become more and more convenient.